Here is an excerpt from a post titled The New Age of Entitlement by Jim Jackson of ConnectedFamilies.org and I was impressed with the insights around our kids’ sense of entitlement and Jim’s belief and assertion that your family can choose to be different. One of my step dad’s favorite stories to tell about my brother happened when he asked my brother to go sweep out the carport. We always had a variety of chores we were required to do around the house but on this particular day my brother grumbled, “You just keep me around to do work, I’m not a janitor!” Now at the time, my brother could not have been more than 8 or 9 years old and in hindsight, this is a funny comment. To my step dad’s credit, he did not laugh or get angry in the moment, just told my brother he better get his chores done. I am sure there would have been consequences if he had not complied but he got it done, along with all of the chores required of us until we moved out of the house. I often thank my step dad for teaching us how to work, the importance of chores, the value of a clean house and money in the bank. Lots of valuable lessons were learned and I in turn am passing those lessons on to my own kids. Researchers tell us that American parents are too child-centered, that making our kids happy is more important to us than teaching them responsibility, and that as a result, kids generally are growing up less prepared to take care of themselves and others than ever before. Lynne and I agree. Not so long ago it was different. For all of human history, until the last 60 years or so, kids were expected at young ages to do what they could do to help their family survive. In other words, their contributions were necessary to keeping others afloat. Faith and values were passed naturally through this process as children and parents shared in the responsibilities of day-to-day life. Every child was an asset because every child was another worker in the labor force of the family/clan. Kids felt significant not just because parents said ‘I love you’ at bedtime or sent notes in their lunchbox, but because they knew that if they didn’t do their part others would suffer. This concept of being needed is absent in most American homes. Instead of growing up to believe they are here for others, kids grow up to believe that others are here for them. The way to change this cultural epidemic is to change what happens in our homes. The first thing Lynne and I suggest for countering this trend is to give your kids meaningful jobs as early and often as they are capable of carrying them out. Give them jobs that if not done will result in consequences for other people. As much as possible, set up systems and structures that truly depend on the child’s participation. Being needed gives kids a healthy sense of significance and purpose. Practically, are you willing to take the time now to train your two-year-old to set the table? 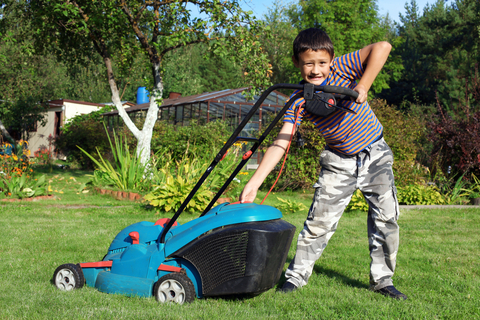 Are you willing to give a five year-old the responsibility of preparing and serving breakfast, or your ten-year-old that of mowing the lawn? Of course, if you’re in your easy chair reading the news while he works, your child will feel enslaved. But if you use that time to bless someone else – even someone outside the family – and then tell stories about how everyone’s contributions blessed others, you’ll be well on the way to developing a strong sense of the value that your family is blessed to be a blessing. To learn more about ConnectedFamilies.org and the programs they offer, visit them online here. MInette – Glad you saw this! Thanks for sharing it in your network. Let us know if there are specific ways we can support your vision.